Having a great time signing books and hanging out with Manager Josh and Irinia at Pino Gelato in Destin, Florida. July 24, 2017, started out as an ordinary day. Then! 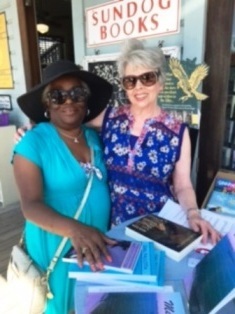 What could be more exciting than signing a Pelican Book Group Contract? 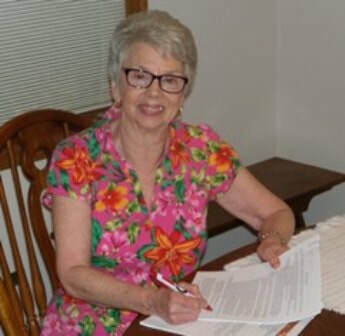 Signing two Pelican Book Group contracts. Coming soon—a re-release of Stopped Cold, my teen novel, and release of my new romance with mystery and humor, Hair Calamities and Hot Cash. ​Russell, one of the managers, and I at The Daily Grind Coffee Shop in Marietta, Georgia. What a fun place to kick back and hang out. 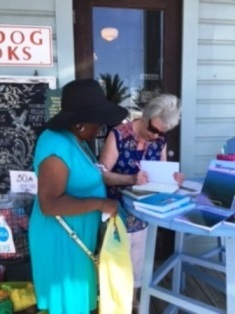 ​Meeting new friends at SunDog Books in Seaside, Florida. What fun! 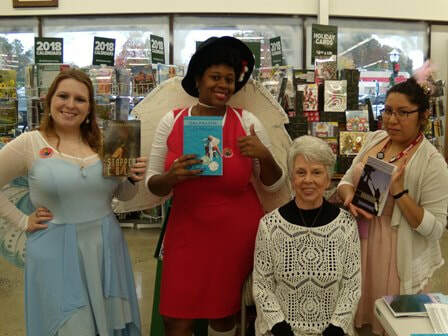 The children's story time leaders at Half Price Books in Marietta, Georgia, help promote my novels at a book signing! It's a great place to meet people and chat.